NeoOffice has been around for ages and I keep expecting and wanting it to get better to the point where I don’t feel an urge to buy iWork or, heavens forbid, MS Office. I installed it on my work machine yesterday and I’m sorry to report they’re a LONG way off yet. Firstly, it does not play nice with Spaces so it’s simply not Leopard ready. Poor show at this stage of the game. Secondly, the spell checker is broken, AGAIN. I had problems with this during the very early days of NeoOffice and then they got it fixed but now it’s bust again. What good is a word-processor that can’t spell-check? It’s possible that the spell checking problem is showing up because my computer is configured to use British English rather than American English but that’s not a valid excuse. NeoOffice is still sluggish, un-polished and buggy. I’m sorry to have to report that but it’s the truth. The sooner the native OS X port of OpenOffice comes out the better. Those of you who actually poke around my Photo Gallery may have noticed that I’ve had a section for desktop wallpapers there for a while now. You may have wondered why I’d never blogged about it before. Well, the reason is that I wasn’t happy with my wallpapers. They all looked a bit flat to me. I spent a few hours this evening tweaking them and now I’m finally happy enough to announce them. They are still far from perfect. I still consider them amateur creations, but I’m not ashamed to announce them any more. So, here’s the link. While trying to get these wallpapers into a descent state I came across two very cool GIMP tutorials, one which really lets you boost the colour intensity of your images, and another that lets you create really cool partly colourised black and white images. This will work on Unix, Linux and OS X as well as through Cygwin on Windows. If, like me, you spend a lot of time using SSH you’ll probably like the idea of being able to log in to servers without a password. If you really want this you can do it by setting up a SSH key pair with an unencrypted private key. This works, it lets you log in to your servers without a password. HOWEVER, it’s a simply disastrous idea from a security point of view. The only reason I don’t do this is because the idea of an unencrypted private key scares the bejeesus out of me. Hence, I still dutifully type my SSH password each time I connect to a server, and each time I check something in to source control. I’ve been keeping an eye out for a simple solution for a while but hadn’t been actively thinking about it for months. That is until I came across Dave Dribin’s blog post Putting the “S” Back Into SSH this morning. Dave rightly points out that there is a solution, ssh-agent, the problem is it’s a command-line tool and by all account not the simplest one to use. So, what’s obviously needed is a nice GUI for ssh-agent. Dave initially thought he’d found the solution in the program SSHKeychain. SSHKeychain is more of a proxy for ssh-agent than a GUI for it though, and Dave soon discovered that it has it’s fair share of problems. So, in the end, I didn’t decide to use SSHKeychain. However, the post inspired me to have another go at finding a solution. Also, the reference to ssh-agent sparked a vague memory in the back of my head of an OS X GUI for something to do with SSH that had the word ‘agent’ in its name. Although we should all be very well organised and we should never forget about files on our disk, we all leave files lying around where we shouldn’t. Then we forget about the files, and a few months later we’re wondering just where all our disk space has gone! Ideally you’d want to be able to get a visual representation of your disk where large files stand out no matter where they’re hidden. Windows users have had a solution to this problem for a long time with WinDirStat. 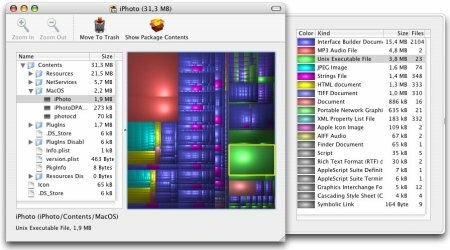 There is now a port of WinDirStat for OS X called Disk Inventory X. This is very simple and very intuitive program and what’s even better is that it’s free and open source! Although it’s a port of a Windows program the port is well done so it looks like a proper OS X application. I reviewed Perian a few months ago when it was at version 0.5. I was already very happy with it then, but it’s gotten better. It used to just be a simple QuickTime component, now it comes as a Preference Pane so it can be easily controlled from within the System Preferences app. It still does everything it used to do, and indeed more, but now it’s easier to manage. If you run OS X Tiger (doesn’t work on earlier versions) and you haven’t already done so, now is the time to download and install Perian. Modern hard disks have a built-in system called SMART for monitoring themselves. SMART makes information on the health of the drive available to the OS. It’s far from perfect, SMART errors don’t always means your drive will die, and not all drive deaths are predicted by SMART but it’s still a good indicator all the same. Now, it’s great having all this SMART data there but it’s no good if no one reads it! OS X CAN read it but it doesn’t do so on an on-going basis. In fact, the only time a default OS X install will read the SMART data is when the Disk Utility app is opened. That’s where SMARTReporter comes in. It polls your SMART data at a given interval (default is once an hour) and lets you know if there’ any problems. It can do this in three ways: it can change the color of an icon in your menu bar, it can pop up a message, and it can send an email. You can choose to have it do all, none, or some of these things. The menu bar icon is perhaps over-kill but some people may find it re-assuring to see a nice health green hard disk icon indicating that SMARTReporter is running and that it has found no errors on any of your drives. As soon as it finds a problem this icon will turn an ominous red color. I’d suggest everyone run this app on their macs but just turn off the menu bar icon. That way it runs totally in the background and totally out-of-sight until there is a problem, which will hopefully never happen! I should also mention that because of limitations with the USB to ATA bridge this will not work with USB hard drives. It will also not work with FireWire drives because Apple’s drivers for FireWire don’t pass on the SMART data. This limits this app to internal ATA(IDE) and SATA drives, i.e. regular internal hard drives. Finally, this app is both free and open source being released under the MIT license.